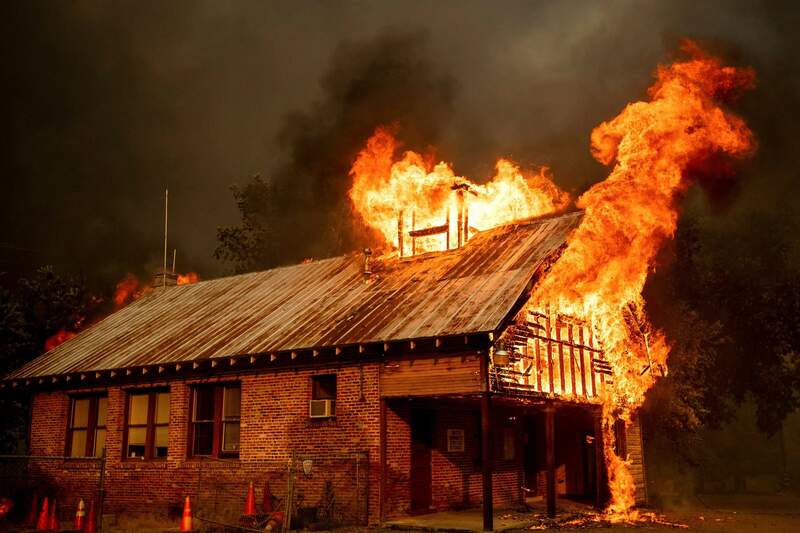 An historic schoolhouse burns as the Carr Fire tears through Shasta, Calif., on Thursday. Fueled by high temperatures, wind and low humidity, the blaze destroyed multiple homes and at least one historic building. 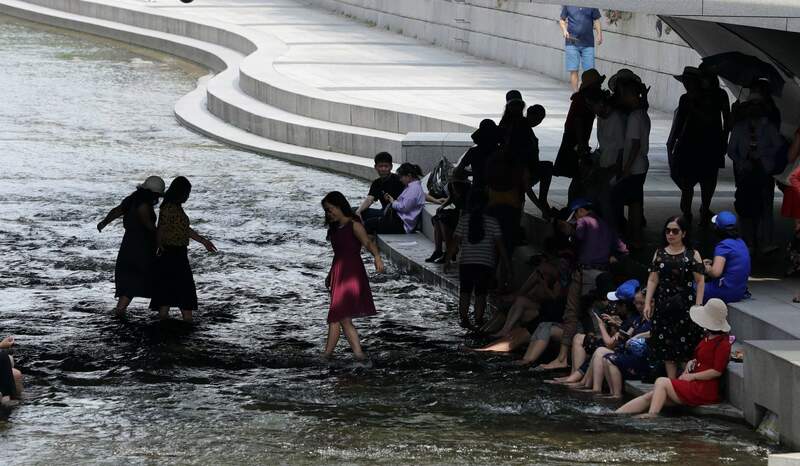 Visitors rest in the shade in the midday heat at Cheonggye stream in downtown Seoul, South Korea, on July 23. The temperature in a city north of Tokyo reached 106 degrees Fahrenheit on July 23, the highest ever recorded in Japan, as a deadly heat wave gripped a wide swath of the country and nearby South Korea. 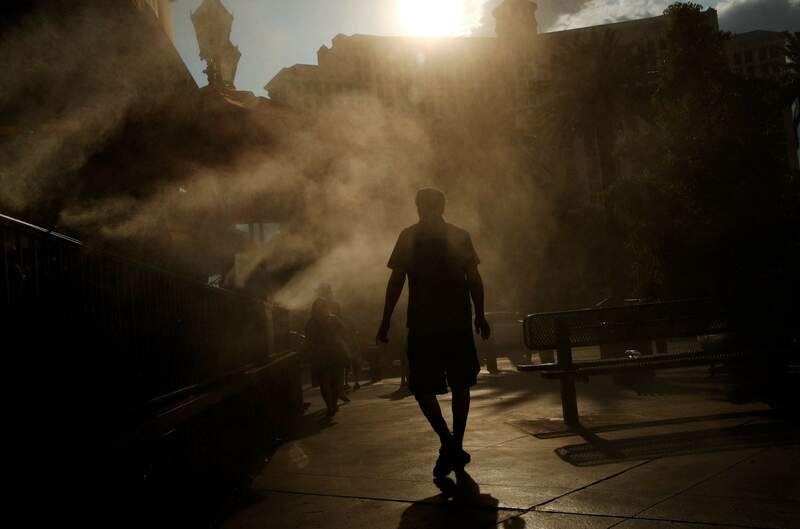 A man cools off in a water mist along the Las Vegas Strip on Thursday in Las Vegas. 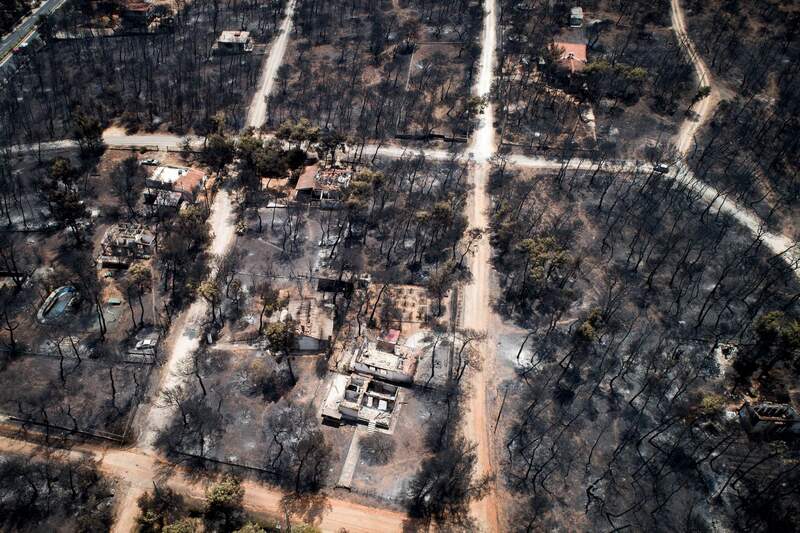 This July 25 aerial photo shows burnt houses and trees after a wildfire in Mati, east of Athens. Frantic relatives searching for loved ones missing in Greece’s deadliest forest fire in decades headed to Athens’ morgue on July 26 as rescue crews and volunteers continued searches on land and at sea for potential further victims. The Carr Fire burns along Highway 299 in Shasta, Calif., on Thursday. Heat waves are setting all-time temperature records across the globe, again. 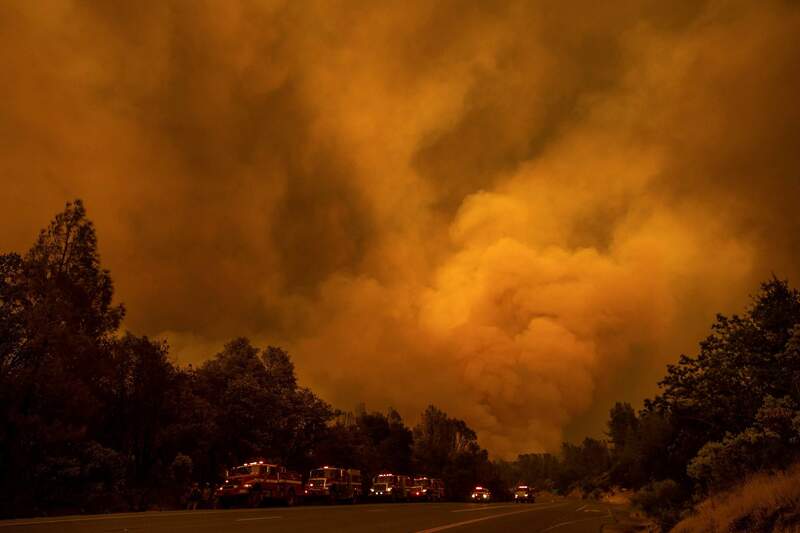 Europe sustained its deadliest fire in more than a century, and one of nearly 90 large fires in the U.S. West burned dozens of homes and forced the evacuation of at least 37,000 people near Redding, California. Flood-inducing downpours have pounded the U.S. East this week. It’s all part of summer – but it’s all being made worse by human-caused climate change, scientists say. Japan hit 106 degrees last Monday, its hottest temperature ever. Records fell in parts of Massachusetts, Maine, Wyoming, Colorado, Oregon, New Mexico and Texas. And then there’s crazy heat in Europe, where normally chill Norway, Sweden and Finland all saw temperatures they have never seen before on any date, pushing past 90 degrees. So far this month, at least 118 of these all-time heat records have been set or tied across the globe, according to the National Oceanic and Atmospheric Administration. Climate change is making the world warmer because of the build-up of heat-trapping gases from the burning of fossil fuels like coal and oil and other human activities. And experts say the jet stream – which dictates weather in the Northern Hemisphere – is again behaving strangely. Climate scientists have long said they can’t directly link single weather events, like a heat wave, to human-caused climate change without extensive study. In the past decade, they have used observations, statistics and computer simulations to calculate if global warming increases the chances of the events. “The world is becoming warmer, and so heat waves like this are becoming more common,” said Friederike Otto, a member of the team and deputy director of the Environmental Change Institute at the University of Oxford. Erich Fischer, an expert on weather extremes at the Swiss Federal Institute of Technology in Zurich who wasn’t part of the analysis, said the authors used well-established methods to make their conclusions. A devastating fire in Greece – with at least 83 fatalities – is the deadliest fire in Europe since 1900, according to the International Disaster Database run by the Centre for the Research on the Epidemiology of Disasters in Brussels, Belgium. Seth Borenstein reported from Washington, Frank Jordans from Berlin.The Associated Press Health & Science Department receives support from the Howard Hughes Medical Institute’s Department of Science Education. The AP is solely responsible for all content.